Musings Over a Barrel: Where in the 'burg is that? I came across this interestingly labeled structure today. Any observant folks in the Fredericksburg area know where it's located, and what it is? My guess would be out at the Virginia Gentleman operation at Bowman. 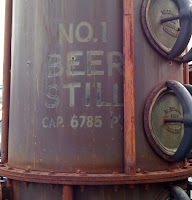 I say this only because the vertical beer still is used in most bourbon distilleries. You got it Roy! This is one of two that are standing at the entrance to the parking lot at the Bowman complex. Coincidentally, right across the street from the Blue & Gray Brewery.